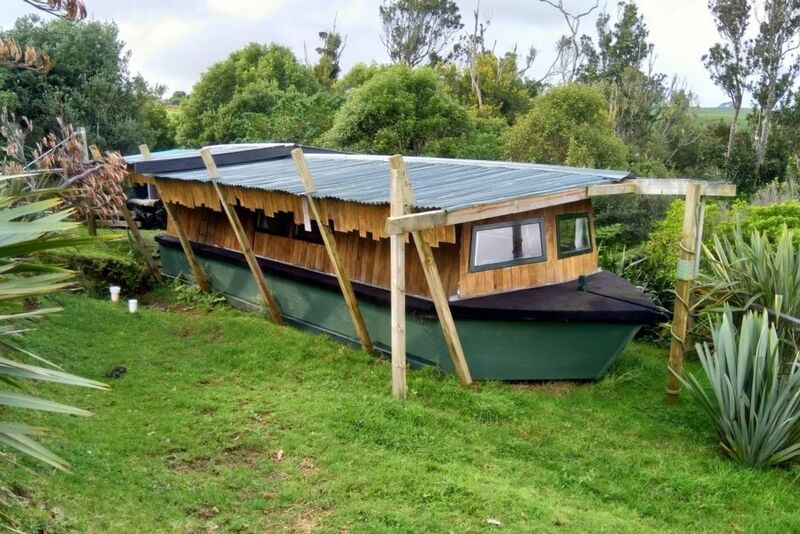 This gorgeous self contained House Boat cabin is set on our lifestyle property which overlooks Aotea harbour, the Tasman sea and Mt Karioi. Enjoy the most amazing sunsets and star lit nights in a peaceful relaxing environment. Listen to the abundance of bird life while sitting on your own deck or taking a short stroll through our small stand of Native bush. Completely operated off wind and solar power. We are located 15 mins drive away from Raglan and Ruapuke Beaches with Bridal Veil Falls and the Te Uku Wind farm closer still. If you are expecting 5 star luxury accommodation then our place is not for you....Our focus is on genuine people wanting something a little bit different for a completely affordable price. More photos regularly updated on Facebook "Ridge and Glory Accommodation"
- Towels are NOT provided though are available for a small fee. - Please tell us on booking request if you will require the single bed made up also. We had a weekend of total relaxation. Hubby usually chooses were we escape to because he likes all the creature comforts of 5 star hotels. I chose the boat because I love peace & quiet and something a bit different. I knew I would love it but unsure that hubby would. Turns out he loved it as much as I did. Although it’s an old converted boat it had everything we needed for our stay. It’s been refurbished beautifully. I found it cleaner than most 5 star hotels. If you want somewhere to escape to and just relax this place won’t disappoint you. I just wish I’d had more time off work to stay another night ....or 2. Brendon & Helen were very welcoming and helpful with suggestions on where to go and what do in the area. All in all it was an awesome weekend. If you are looking for rustic, peaceful and not your normal hotel room then this is the place for you and also close to Raglan. Unique accomodation in great location. We really enjoyed getting away for the weekend in this unique little spot. Incredibly quiet and so dark (the stars were amazing), so an ideal spot to catch up on rest. The bed is good and the room cosy. Close enough to Raglan to enjoy the eateries and shopping, but still very secluded. The only things we missed were wine glasses (which were promptly supplied by the owner), and a place to picnic, as there is no outside spot to enjoy the view and sunset unless you sit in the paddock with the horses (which we did). Friendly and relaxed hosts. Beautiful place, would recommend to all. If you want a comfortable, friendly and private experience that’s affordable, you’ll get it here.